Hours of Operation, Monday through. to Saturday. BURN PITS AT ALL LRWSC SITES MAY BE FORCED TO CLOSE DURING COUNTY IMPOSED FIRE BANS. PLEASE CONTACT US FOR FURTHER INFORMATION. 403-782-5300. WE CAN NO LONGER ACCEPT DEMOLITION MATERIAL WITHOUT AN ASBESTOS FREE CERTIFICATE. THIS INCLUDES THE DEMOLITION MATERIAL OF ALL BUILDINGS. 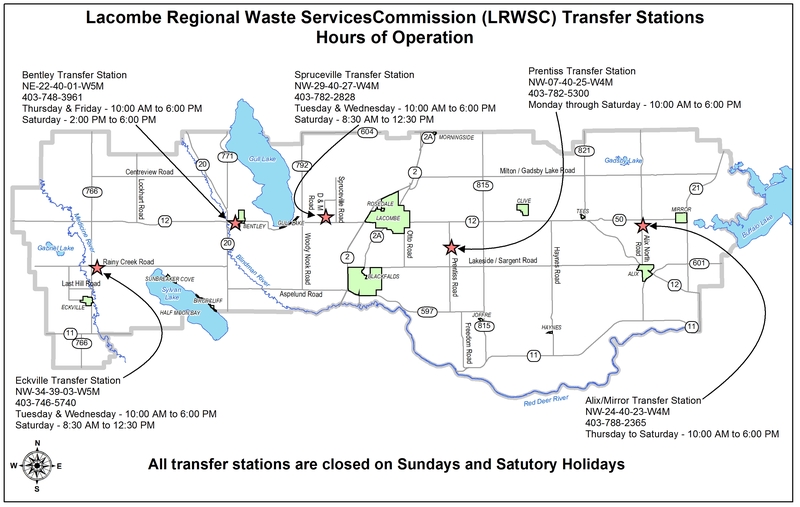 Lacombe Regional Waste Services Commission owns and operates five solid waste facilities within the Lacombe County boundaries. We have transfer sites at Eckville, Bentley, Spruceville, Alix/Mirror and a transfer site and Class 3 landfill at our Prentiss location. We currently landfill approximately 10,000 tonnes of dry rubble annually and transport almost the same volume of MSW (household/kitchen waste) to the Class 2 landfill at West Dried Meat Lake. Please click on the above categories to find the specific details and information you are interested in. Under transfer sites you will find the phone numbers, operating hours, acceptable waste and non-acceptable waste of each site.